Download Content can be used for archiving content from SharePoint lists, libraries and sites. Here are the options that can be specified while exporting your content with ShareGate Desktop. This option is only available if you selected at least one site to export. Select this option to export the content from all the subsites of the selected sites recursively. This option allows you to completely eliminate any folder structure you had when copying to the destination, and put every document at the top-level. Select this option if you want to export all the versions of your items, otherwise only the latest version will be exported. Note: this option can greatly slow down the export process if the exported items have a lot of versions as ShareGate Desktop will have to download the document and/or metadata for each version. 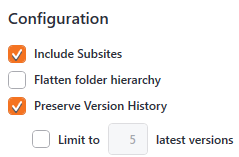 This option is only available if you check “Preserve version history” first. This option allows you to keep only a portion of the version history, which is way faster than exporting all the versions. When selected, ShareGate Desktop will only export the specified number of versions (starting from the latest) for each item.